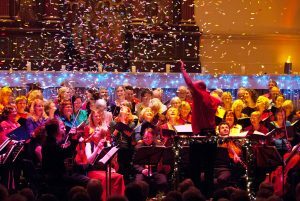 A feel-good festive evening of carols and Christmas music — come and sing all your festive favourites with members of City of Bristol Choir, accompanied by the Bristol Ensemble and led in entertaining style by David Ogden. Bring the family for a wonderful evening of singing. Tickets £23 (£22), £19 (£18), £16 (£14), £12 (£10), £6 students in full time education, £4 under 18s (plus St George’s booking fees) from St George’s box office online or by phone on 0845 40 24 001, or from the box office in person. The box office is open for telephone calls and personal callers from 9am to 6pm Monday to Friday.